"Gloria The Maiden of Peace"
Reiki Master, I infuse healing energy into every artwork that is created. A pillar of light is established from source into the artwork and the energy is grounded into the earth with energies of peace, joy, protection and abundance. For the price list please go to the drop down menu under title "Koi Ponds"
This pond was installed by Brenda Hawkins of Livingscapes in Rio Vista for my clients Karen and Kent Caraway. She did a fantastic job of setting stone slabs around the pond, placing the plants and putting nighttime lighting to showcase the pond. I am so very blessed! 2 Part highly sculptured fish, flowers and pods attached with a faux waterfall. The dimensions are: upper level - 33" x 38"
lower level - 26" x 28"
Why Koi Ponds? There is something magical about Koi Fish. I love the movement in the water and the character in each fish. 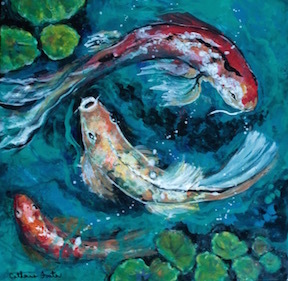 It is a joy to create these Koi Fish on many different surfaces. See available signed and numbered tiles below for sale.